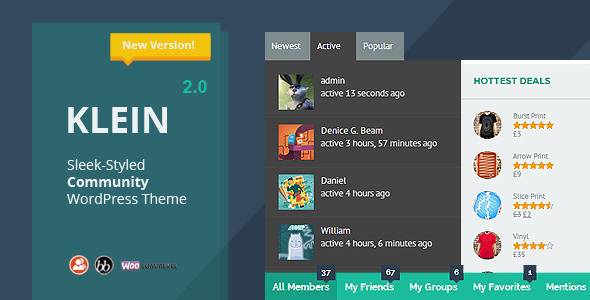 Version 2.0 is now available for download. (10/14/2013) Always use the child theme for heavy customization. Thanks! Klein is an innovative WordPress theme built to support BuddyPress, bbPress, and WooCommerce out of the box. Perfect for website that interacts with lot of users. Now your members can create profile, send messages, add connections, or share what’s happening in their life. Collaborate through forums or sell any products you want. Version 2.0 of Klein allows you to create unlimited number of layouts with ease. Just select a component and drag it to your desired location. There are over 45 components to choose from ranging from simple text area/content to complex BuddyPress components like ‘Activity Stream’, ‘Members Loop’, ‘Groups Carousel’, etc. This theme integrates and bundles the following premium plugins which you can get for free if you purchase this theme. It’s $40.00 worth of value! ladydekadeThis theme is so easy to set up and one of the best i have worked with, well done! ghogWhen you buy this theme, you don’t only get a awesome theme. You get the best customer support, seriously! 5/5 dunhakdis is a really nice person.For example, I just wanted to move my commentfieldbox to the top (just above the comments) – and he helped me with it.Now in my experience, most authors say no to a question like that.So thank you dunhakdis for being so awesome and helpful! KeyMasterProI’ve bought some top rated quality themes that most people bought, and it was awful for bbPress, also as I’m no professional code-guy, it just didn’t do anything good for me.But this theme! <3 saved my site.I love how you can so easily change the fonts in this theme, and so many options too! This saved my bbPress forums, they now look much better. And the support system dunhakdis uses is great, he continues to help me out and I’m grateful for that!Just want people to know my experience as a customer.55 star! pxlcrafts This is a fantastic theme with loads of options and clean code. The setup was straightforward and so far has beautifully integrated with a wide range of plugins. I can highly recommend this theme to everyone. This is definitely the best BuddyPress theme out there. 5 stars all the way! Download the new version of theme from your downloads section and upload it to your WordPress site. Your old content should be compatible with the old theme data. Version 1.5.3 is still available inside the package.